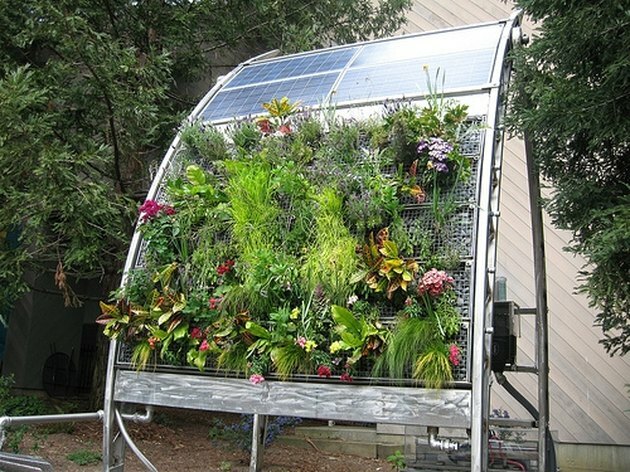 Many people enjoy gardening without the use of soil and just use water, called hydroponic gardening. Just as soil provides nutrients to the plants, planting using only water also needs a method of providing nutrients to your plants. There are many commercial fertilizers, but making your own is less expensive and just as good as commercial fertilizers. Deficiency in any nutrient will cause damage to your plants. 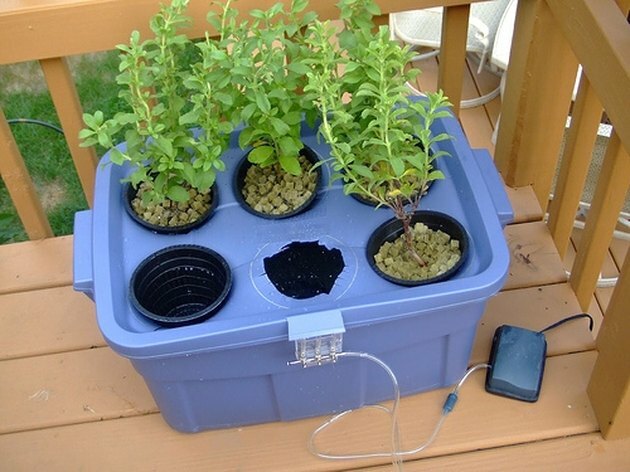 A simple hydroponic garden setup. A rather sophisticated hydroponic garden. When you make your nutrients yourself, you are sure to use pure organic nutrients. With commercial hydroponic fertilizers, you can't always be sure of the quality of the nutrients. There are three key nutrients all plants need: nitrogen, phosphorus and potassium. There are an additional 10 elements needed in hydroponic nutrients: sulfur, magnesium, calcium, iron, manganese, zinc, copper, chlorine, boron and molybdenum. Nutrients must be in the proper proportions to grow along with maintaining proper pH levels. Purchase the following nutrients: 15 ounces of superphosphate, 10 ounces of potassium sulfate, 5 ounces of magnesium sulfate (Epsom salts), 10 ounces of sodium nitrate and 10 ounces of calcium nitrate. Mix these ingredients in a container and put aside. For your trace elements, use the following: 1 ounce of iron sulfate, 1 teaspoon of boric acid powder, ½ teaspoon of zinc sulfate, ½ teaspoon of copper sulfate and 1 teaspoon of manganese sulfate. Use a different container and combine making sure you mix the ingredients well. Use a mortar and pestle to crush grainier substances into powder. Once mixed into a powder form, mix them with the other ingredients you made. As a rule of thumb, use a ratio of ½ teaspoon of the mixture to 100 gallons of water or mix 1 teaspoon into a quart of water and use 1 liquid ounce from that quart to every 3 gallons of solution in the nutrient system. Don't keep any leftovers because they are not good after 24 hours. Another good hydroponic fertilizer is seaweed. Make a kind of tea by soaking a bag of seaweed for a few days where it gets plenty of sun. Add 1 teaspoon of Epsom salt for each gallon of liquid, then mix the solution into your feeding reservoir. From time to time, check your pH levels. Your pH levels should be in the 5.5 to 6.5 range. Levels can change very easily so check often. It might be worth it to your plants if you want to experiment a little with nutrients. For example, you can make other teas from organic material such as earthworm casings, eggshells and bat guano. Try crushing vitamin B tablets with your mortar and pestle. Put these into your feeding reservoir as you did with the seaweed tea. Many gardeners often use sphagnum moss, rockwool or lava rock to hold the plants straight. Kathy Eastwood is an avid freelance writer and works full time as a photojournalist for a weekly tabloid at West Point, N.Y. She has over seven years experience in writing professionally and in writing Web content. She attended New Paltz College in New Paltz, N.Y.